Yes, I know some of you have seen this already. Yes, I know it’s unseemly to be so fond of a picture OF MYSELF. *Apparently my world is damn small, and consists of a Facebook profile, and a blog with 4 readers. **I KNOW. The photographer was magical. *Of course, I also have half-a-dozen others of which I’m likewise enamored, displayed on my bulletin board and stored in a special file on my desktop for easy retrieval (you know, that folder full of Teh Happy). This picture makes me very happy. It makes me a little nostalgic, actually, because I haven’t had a time that made me laugh like that in forever. Also, I never look this good in photos. See how I did that? How I somehow made a picture about you about me? It’s a gift, I tell you. Dear photographer: come to my house with the happy drugs next. If you love it, you should go with it, babe. I like entirely too many photos of myself, and I’ve got the enormous Facebook profile picture library to prove it. You look absolutely gorgeous. And I’m willing to bet you look that good pretty much all the time. 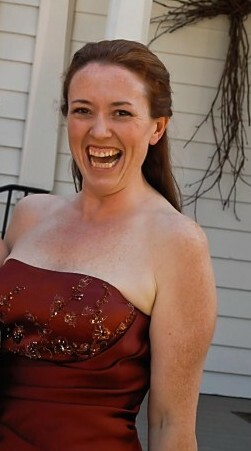 I think this picture is so you — even though I’ve never actually met you, in person, but this is the you I see when I read your writing: big smile, screaming, red-headed and strong.